Hidden among the many news stories that unfolded at this year’s UFI Global Congress was one that TCEB is particularly proud of. The promotion of Kanokporn Damrongkul (Kelly) to Director of Exhibitions begins a new chapter in our organization’s exciting story and continues the legacy created by Jaruwan, who assumes a new directorship at our MICE Intelligence & Innovation Department. 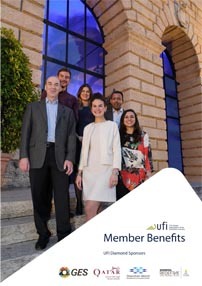 A familiar face at UFI events, Kelly is a longstanding member of TCEB. Here she gives her thoughts on the industry at home and abroad as she moves into her new role from her previous position as Senior Manager of Business Development. What advances have you seen in the Thai exhibition industry in the time you’ve been in the industry? “The exhibition industry has evolved a lot. Digital has become a key factor and online complements the offline platform, especially trade shows in light industry. New technology has become a key success factor for show organizers in terms of generating the growth and revenue of their trade shows. Technology will enable organizers to engage with visitors/exhibitors/sponsors 365 days a year, and enable them to use the data wiser. What opportunities and threats are there for exhibitions in South East Asia, from competitors elsewhere in the world? I see more opportunity than threats for the competitive landscape in SE Asia. There’s huge interest in the ASEAN market from Asia, Europe, the USA and new markets such as Japan and Korea. Market competitiveness has kept Thai exhibition infrastructure up to speed, ensuring we are ready for business focused on South East Asia, and enabling TCEB to more aggressively develop our new business approach. How will your previous role in business development help you in the new position? What lessons have you learned about the exhibition industry in Thailand – and in general? My key responsibility was to build strong fundamentals to facilitate international and local organizers and exhibitors looking to tap trade opportunities in ASEAN through exhibitions. What I learned is that TCEB should perform as a creator and initiator; leading the trends and creating business opportunities for key stakeholders in Thailand. This will be one of my key areas of focus in the new role. How is TCEB helping Thailand to realize the Government’s ‘Thailand 4.0’ objectives? The government’s Thailand 4.0 program aims to encourage cooperation between the government and private sector to support innovation and digitalization of the country. The exhibition industry is a market platform that publicizes technology and commercializes transactions between new business and new start-ups adhering to Thailand 4.0 policy, with the focus on promoting innovative and emerging industries. Currently, we have a supporting programme ‘Pitch for Boom’ to help create business opportunities for Thai exhibition venues seeking to bring international exhibitions to Thailand. One recent success story from this campaign is Thailand being chosen as host of the renowned exhibition ‘CeBIT ASEAN Thailand 2018’ by Deutshe Messe AG, Germany and IMPACT Exhibition Management scheduled to take place on 18-20 October 2018.